Debra Heather took a few minutes to talk to the director and screenwriters of Time Lapse, a film making its Canadian première at Fantasia this year. The film won awards in London’s Independent Film Festival 2014 and has been an international selection at numerous world-wide festivals. Here is their interview. Debra Heather (DH): What makes a film great for you? In your opinion, are there certain qualities that make a film? BP Cooper (BC): A great film for me is one that lets me completely immerse myself into the story and experience. No matter what the genre, I want to connect to the characters and their journey to the point where I become emotionally invested in them, worrying about their fate. I think truly great films can pull that trick off. Bradley King (BK): I agree with Coop, of course that’s vital. In terms of science fiction, I tend to prefer films and books that are at the core of the story there’s a theme that has to do with the human condition somehow. It’s often very simple, à la Bladerunner and the question “What makes us human?”. However, as simple as it is, so many science fiction movies lose this core amid all the explosions and aliens and time travel, and it’s a real shame. DH: What was the most important lesson you had to learn that has had a positive effect on your film? How did that lesson happen? Coop: Never assume you can’t get someone to work on your film because you think they won’t be interested, or can’t afford them, or because they are busy people, etc. One example was me asking Producer Rick Montgomery to come aboard. I almost didn’t even ask because I assumed the answer would be a version of “no thanks too busy,” but he responded positively and we quickly found ourselves with a very strong producing partner who opened doors for us around town. Another example is composer Andrew Kaiser; I was initially apprehensive because I knew how busy the guy was and thought there is no way we could afford him. He read the script, saw some of the rough footage, and thankfully decided to take on the project and created a brilliantly haunting score. High caliber talented people are all around you, so just ask for their help! BK: The most important lesson I learned was that I was capable of directing a feature film. I’d done a lot of shorts, but I didn’t know how I’d handle the big game. It seems silly in retrospect, but I remember that leading up to the first day of shooting, I genuinely had internal questions like, “Will this kill me? Will I get two weeks into the shooting schedule and just have a heart attack from stress and die?” Thankfully I think it only took two or three days of shooting before I realized no, this is just like directing a short. In fact in some ways it was easier, because on a feature everyone is taking it a little more seriously. It’s heightened. Everyone is trying to bring their A-game because they believe in the project, and are hoping to accomplish something profound in the end. DH: Generally speaking, when we want to learn about a film, we talk to the director. But those that make films know how much they are really collaborations. What makes for a successful collaboration? How did your collaboration with director Bradley King come to be? Coop: I’ve known Bradley for many years now, since back when he was in film school. I’d done a few of his short film projects here in LA, and we had worked on getting another feature off the ground, so there was an existing Director/Producer working relationship on top of our friendship. Through our struggles of attempting to get a bigger budget feature financed, we realized we’d be better off trying to make something smaller that we could immediately finance. The result of that effort is Time Lapse. I would certainly categorize it as a successful collaboration, even if the film wasn’t as well received as it currently is because the process of writing and shooting was so entirely enjoyable. Working well with someone else is something that is organic, as personalities have to mesh, it’s not something you can force or fake. You can certainly work with people you don’t get along with and create something great and call said project “successful” if it turns out well – but for me life is too short for such a thing. I’d much rather work with people I genuinely like and have fun during the process. End results to me mean little if an enjoyable journey isn’t part of the package. Bradley and I have very similar tastes in movies – and dark senses of humor – and that commonality helps anchor our working relationship. BK:: Yeah there’s a few schools of thought on this. I think you need qualified people around you, but I also feel that life is too short to work surrounded by jerks. Ideally, you can find a balance of people you really enjoy going to battle with, who are also passionate, creative and qualified. If that attitude means my movies may suffer because I didn’t hire this-or-that jerk face “genius” to collaborate with, then so be it. Even though people say cinema is eternal, the truth is that in 1000 years all the movies made this century will probably just be a few bits of data in a storage server on the moon, which middle school kids will be forced to study and complain about because they’re not in 5D or whatever. Better enjoy the process because life makes no guarantees! DH: Films evolve through the creative process – sometimes most dramatically in the editing process. It’s often hard to reconcile the difference between what we desire and what we achieve. How have you encountered this and how do you move through it? Coop: Editorial is both a magical and brutal process. Magical in the sense that all the pieces are coming to life as one organism, yet brutal when certain scenes aren’t quite working, or worse, when you have to cut something out that you love. I’ve certainly encountered it on Time Lapse. One example would be the scenes we shot with the amazing John Rhys-Davies, who played Mr. Bezzerides. He nailed his scenes, but it turned out they presented information that was recently provided by another character, so it became redundant. This in turn slowed the film down at a stage where it needed to be speeding up. It was clear the scenes had to be cut due to those two factors, and it was a very hard decision for Bradley to make, but to his credit he went with what served the story over including the material with one of his childhood acting heroes. It was also a valuable lesson as screenwriters, because it’s something we could have solved in the scriptwriting phase of things instead of discovering it in the editorial. Live and learn. BK: I’ll be honest – in all my previous projects, with only a few exceptions, when I finally sit down to edit, and I watch all the dailies – I cry. I actually cry. It’s devastating! You had all these wonderful dreams and imaginations of how the script would be captured, and then you have to face the gulf between that and what you actually got. I warned Tom Cross our editor that I might have this breakdown, but thankfully it didn’t happen. Of course, there were shortfalls and discrepancies, but overall I felt pretty good. And during the process of editing, Tom did an insanely good job. The guy could be a professor of cinema; he’s that knowledgeable about film history. It’s surreal. He had a lot to do with the final crafting of the movie, and I can’t wait to work with him again. DH: What role have film festivals played in your life so far? Why are they necessary? How do you get the most out of them? Coop: Festivals serve some very important purposes for independent films I’d say publicity, credibility, affirmation and networking. Those are the four main things I feel that festivals give back to the filmmaker. There is of course also copious amounts of FUN one can have as well, depending on how much you wish to partake in the social events. In that regard, it’s important to pace yourself, or you’ll burn out quickly on a trip. Don’t ask me how I know. BK: For the years I was laboring on shorts and writing screenplays that never saw the light of day, the festival circuit was like a shining beacon of hope. Not just for my career, but for my life – I was so looking forward to the day where I could travel to foreign countries and have a real reason to be there and interact with the locals. Of course at the heart I also wanted to be able to have a reason to be at film festivals – I’ve attended many as a tourist, and I enjoy them so much, but you always have that yearning to be invited and be able to present something of your own. Fortunately, with Time Lapse I got my wish, and it’s been an incredibly rewarding experience. The absolute best part has been witnessing audience reactions to the movie; if nothing else, that alone would give me the energy and inspiration to make another movie. Seeing people laugh or gasp, it’s just feels like, “Wow, I did my job, we’re connecting with people and giving them an experience.” And on top of it, getting to be a part of the festival family is so fun! From the interns, all the way up to the programmers, you get to be a part of this great behind-the-scenes group that is so exceptional – it’s intoxicating to be surrounded by people who are so passionate about cinema. DH: We are all here at Fantasia, because we adore cinema. How did your love for movies get ignited? Coop: My parents did a great job of making sure us kids went outside to play, and part of that strategy was to prevent us from watching television and most movies – sans the occasional Disney film. The problem was being denied access to movies, so young made their impact on me that much more powerful once I was finally able to watch them. For my friend’s ninth birthday party, his mom took us all to see Back To The Future. My mind was blown, and I came out of knowing two things 1) I now want to see every movie ever made, and 2) How did people actually create this movie? My interest as both a fan and filmmaker was ignited. BK: My mom and I like to joke that my first movie ever was “Murder By Death,” which she watched in the theater at night and went into labor the next morning. From there I remember seeing Disney movies like “Pinocchio”, and then of course, Star Wars showed up and pretty much became my childhood for a while. The sense of excitement with which I entered the theater to see “Return of the Jedi,” well, if they could bottle that it would be more addictive than any drug! I guess from there, with the advent of the VHS player I started watching a huge volume of movies, but weirdly it wasn’t until I was about 21 than a light bulb went on, and I started attempting actually to get involved in filmmaking. DH: Let’s talk about why you’re here at Fantasia, your film ”Time Lapse,” I just seen it and thought it was a creative and fantastic time travel thriller. Can you tell our readers about your film and what they can expect out of it? Coop: Thank you! 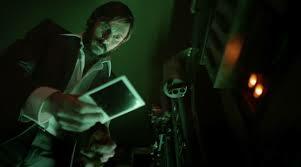 Time Lapse is about three friends who discover a machine that takes pictures 24 hours into the future, and decide to use the machine to better their lives. Since it’s a thriller, things naturally start to get very wrong for them. It’s a cautionary tale at its core theme, but overall we hope it’s entertaining and intriguing. If people finish it, think about it for a bit, and want to watch it a second time, and then that to me is the biggest complement ever, and we’ve achieved what we set out to create. BK: Coop nailed it, I don’t have much to add. I might caution anyone that’s seeking a special-effects-laden sci-fi film, to go in with moderated expectations – it’s much more of a suspense film with a sci-fi twist to it. Time Lapse screened at Fantasia on July 30 and August 2. The movie SUCKED, because of numerous plotholes and characters that are more STUPID than a can of Spam.